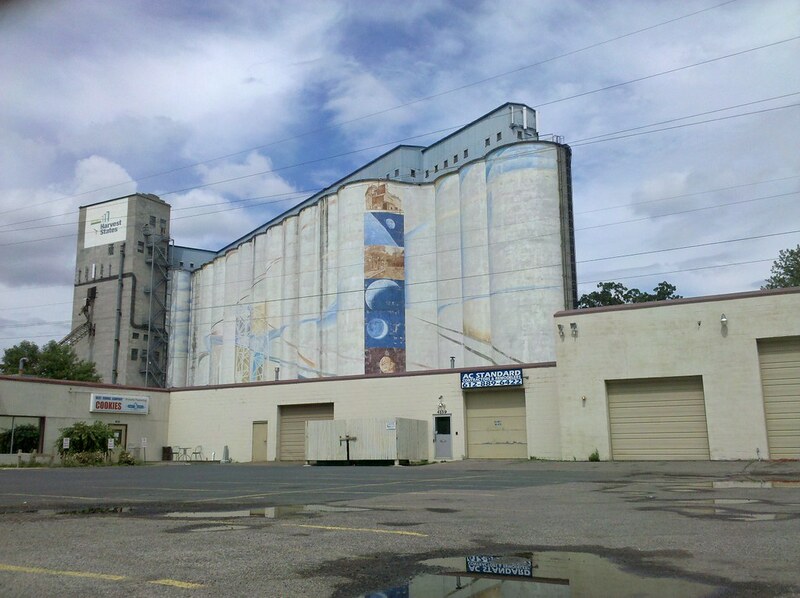 A section of Hiawatha Ave in Minneapolis is lined with grain elevators. I think I saw only one other mural though. This is very atypical of the aesthetic I would expect in Minnesota! I love the almost mystical Victorian (alchemical?) quality. I’ve been following your journey since the Star Tribune ran the AP story about you last week. I am so thrilled that you walked right through my neighborhood yesterday. Those grain elevators are about 5 blocks from my house. I wish I would have known, would be nice to great you in person! Enjoy your stay in the great city of Minneapolis and safe travels on the rest of your journey! I’m so glad you did walk by the Hiawatha elevators! When you mentioned grain elevators in another post, I immediately thought that you need to see these. They’re a wonderful Minneapolis landmark! I’m in Winona now, but I’ll stay tuned to the blog. Maybe our paths will meet! This is also right by my house! I just found this site three days ago, and was excited that you would be coming towards Minneapolis, but figured you’d keep to the suburbs, but you are RIGHT IN MY BACKYARD!! Hopefully you are being treated well while in town, and I’ll keep an eye out for you as I wander around. This is an awesome thing you are doing. AWESOME!